South Florida Rehab & Training Center is a participating provider of most private insurances. Please call us to find out if we are on your plan. At South Florida Rehab & Training Center our commitment is to give excellent care regardless of the type of insurance a patient may have. Patient care is our main concern, so we encourage any insurance questions to help you better understand your coverage. As a courtesy to our patients, we file and process the claims directly with the insurance companies and try to facilitate payment. In the chance that we are unsuccessful, it is ultimately the patient’s responsibility for their bill. If this should ever occur, we are very willing to work with any patient to assist them in any way we can. If your case is an on-the-job injury or a motor vehicle accident a third-party payor may be responsible for payment. We will file the claim with the appropriate insurance company but in cases of denials, disputes, or litigation, the bill is ultimately the responsibility of the patient. Help with work injuries and Workers' Compensation. South Florida Rehab & Training Center, offers a complete work injury treatment program as well as individualized Work Hardening Programs for working patients who are covered by Workers' Compensation insurance. 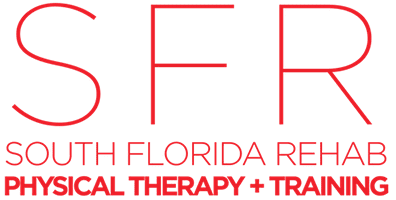 As a Workers' Compensation participating provider of physical therapy services, South Florida Rehab & Training Center offers research-based care to people who have suffered on-the-job injuries. The center also offers ankle/foot analysis and casting for orthotics to help correct deformities, pain or dysfunction without surgery. We offer Active Release Techniques (A.R.T.) manual therapy for appropriate lumbar, thoracic or cervical spine disorders as well as stretching and ergonomic re-education. All physical therapy services are provided by or under the supervision of licensed physical therapists. Our mission is to promote the safe return to function for people suffering from musculoskeletal injuries. The course of treatment includes a thorough evaluation consisting of subjective information, tests, and measurements to assess the patients' current status or level of dysfunction. South Florida Rehab & Training Center then customizes a plan of care based on the findings of the evaluation. The plan of care includes an estimated pattern of visits and visit duration to achieve the safe return of the patient to a work-ready level. Coordination, communication, and documentation with case managers, referring physicians and other professionals are top priorities at our center. Assessment, intervention, documentation, and communication of recommendations are all extremely valuable in the return-to-work effort. Please contact us for more information regarding insurance providers we accept. At South Florida Rehab and Training Center our commitment is to give excellent care regardless of the type of insurance our patient may have. Patient care is our main concern, thus we encourage any insurance questions to help you better understand your coverage. South Florida Rehab and Training Center, also offers a complete work injury treatment program, covered by Workers' Compensation insurance. South Florida Rehab and Training Center is proud to be a participating provider of most private insurances.